I bought some whole-wheat, whole-grain wraps last week with the intent of making some veggie wraps for the first time. This week, I made a large batch of hummus (which warrants its own post, I promise to produce that soon) and I had a lot of vegetables in the fridge. First step, warm up the wrap in a toaster oven just for about 1 minute. 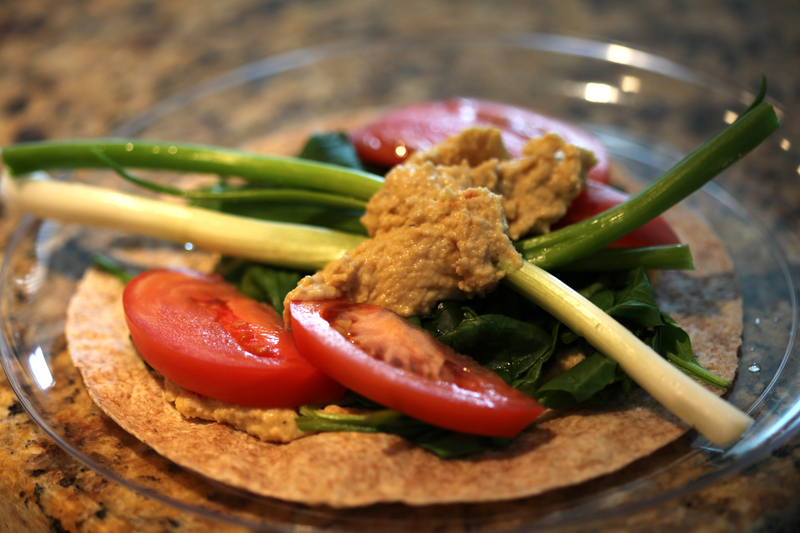 Slather on some hummus which is a great filler and will act as the binding agent in this wrap. Hummus is chock full of protein and nutrients, and is extremely healthy food — especially when it’s homemade. Then I quickly blanched some asparagus in about 1/2 inch of water in a covered pan for just a few minutes. Upon completion, the asparagus has been tenderized but has all its nutrients and flavor locked in still. I didn’t bother to season the asparagus while cooking it. The asparagus goes over the hummus and I add some tomato. You can slice or chop your tomatoes to make them easier to eat. My only suggestion is to use firm tomatoes. Then in the same pan I blanched the asparagus, I now toss in the fresh spinach for a quick steam. The spinach contains enough water on its own from washing the leaves, so no additional water needed. I did add a little bit of vegetable seasoning here. Just a couple minutes and the spinach was ready. I added the spinach on top of the asparagus and tomatoes and topped off the veggies with a little more hummus. The one note I have is to make sure you extract all the water from the spinach and asparagus upon cooking them because they do contain moisture which results in a soggy wrap. As you can probably guess from the ratio of veggies to the size of the wrap, rolling this bad boy into a wrap was a challenge. It was overstuffed and freaking delicious. The next day I couldn’t wait to have another wrap. This time, I layered the spinach on the hummus first, then tomatoes, then green onions which are my absolute favorite thing to eat with hummus, and then the asparagus. Perfect every time. A very filling, healthy, and easy meal to make. One wrap will tide you over for hours. Sorry I have no pics of the wrap rolled up! ← Arctic Char with Spinach and Veggies.